The Rotor INpower Flow MAS power meter (ANT+ enabled) is the cleanest tool for gathering sophisticated power metrics whilst pedaling. With all the electronics housed in the spindle of this elegant Aero Crankset the system is protected from the elements. The Rotor INpower Flow MAS power meter allows you to record your power readings via your ANT+ head unit. Inconspicuously integrated inside the crank axle, INpower is protected from shocks, crashes and outside contaminants plus it allows you to maintain your bike’s sleek, elegant aesthetics. The battery is also located within the bottom bracket spindle. Sophisticated metrics interpret your data through user-friendly software and advise you when to turn up the pace, ease off the pedals, do another interval or call it a day. The new Micro Adjust Spider (MAS), offers more positions to suit every rider’s needs. Their new advanced MAS spider has an alternative bolt hole placement, as well as the standard bolt hole placement (see image below), allowing for intermediate positions between existing OCP (Optimum Chainring Position) of the Q-Ring. A standard crank in combination with the OCP of the Q-Rings, allows approximately 5 degrees of adjustment. The MAS spider when used with Q-Rings offers half positions giving approximately 2,5 degrees. This means that you can micro adjust the position of your Q rings, to suit your riding style. Electronics and battery are integrated inside the axle, making INpower shock and contaminant resistant, and waterproof with cleaner data transfer. INpower uses a standard AA battery that typically lasts 300 hours when fully charged. A rechargeable AA battery can also be used. INpower’s axle-based technology offers a wide range of cranks for both road and off-road riding. 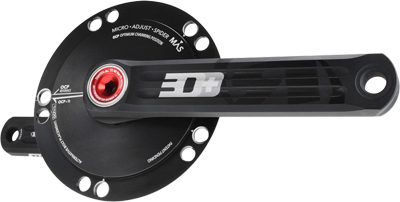 Rotor INpower Flow MAS Power Meter Crankset is rated 5.0 out of 5 by 2. Rated 5 out of 5 by ironmancole from DOESN'T FIT ON TREK BB90 FRAMES Just a word of caution to anyone out there with a Trek as I just bought this for my 9 series speed concept and the Rotor Flow will not be compatible. Found out after ordering it, wish the item description had made that clearer rather than just glossing over with a 'it fits most bottom brackets' phrase so look for other systems if you have a BB90 set up. Rated 5 out of 5 by trickster1234 from The rotor massive power meter is faultless I had stages power meter previously and I was severely disappointed with its unreliability, since buying the Rotor in power crankset it has been flawless I love it. Yes this will fit your bike and the chain rings you enquired about. Which one would fit my Cannondale Super Six Evo Hi-Mod 2015? This would be compatible with your Cannondale you will just need to choose the crank arm length and which BCD you prefer from the drop down menu. You need a 30mm axle BB. If your chainset is currently a 30mm axle then it will be a straight swap. If you have a frame that can accept a 30mm axle via an adapter then this will also work. Can you use standard rings with the Rotor cranks. It is possible to fit other chain ring to these cranks although we would recommend that you fit Rotor chinrings to get the best out of this product. Hi I am looking at purchasing this power meter for my TT bike. Please note that the dimension options provided in the drop down menu relate to crank length. Please select the correct length based on your current cranks for the 110BCD options provided. You will also need to buy new chainrings to use with this powermeter. The Rotor Q rings in the 110BCD option will be ideal for this. Is this power meter compatible with shimano Ultegra 6700 10spd and Shimano 105 5800 11 spd chainrings? This power meter is compatible with all 110BCD and 130BCD chain rings depending on which option you choose. Does this give left and right leg power readings? I can confirm that this will only offer the reading on the left side.